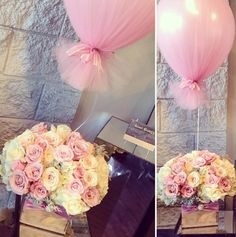 I am planning my daughters communion party and I have seen some balloon center pieces on pinterest which I am very interested in. The picture shows a balloon (looks like a traditional average latex balloon) covered in colored tulle and tied around the part you knot the balloon with pretty bows. Fishing line is good for hanging things and is almost transparent. From a distance you can barely see it. Buy the thin clear/white looking kind. Hope this helps and best wishes! Answer to "make balloons float without helium"
There are ways to get balloons to float with hydrogene. As shown in the video below, you can make hydrogene yourself, using sodium hydroxide, water and tin foil. However, as sodium hydroxide is highly corrosive and can cause severe burns, I wouldn't recommend doing this. Making a balloon float without using any gas at all... hmm, the only way I can think of is to create the illusion of floating by attaching the balloon with fishing line to the ceiling, or any other suitable object in the room. Is there anyway to make balloons float without helium or other gasses? I am planning something special for valentines day and do not have a way to get these things. Any DIY's?? Reply to "Tulle covered balloon base"
Have you considered using clay pots or glass jars instead of plastic cups? Plastic cups are light weight and will more easily topple over. Place a piece of Oasis Floral Foam Brick in the pot or jar (secure with glue if necessary for stability) and glue the balloon stick into the foam. Then place mini pebbles into the pot or jar until it is fully filled. The regular balloon sticks are rather flimsy. Check out these Towashine balloon sticks with floral base at Amazon. You might not even need an extra balloon base with those. If you scroll down the page, you'll see some customer uploaded images of the type of tulle balloons you have in mind. I'm working on an event right now, and I will warn you that balloon sticks are extremely flimsy. I was experimenting on a 30" balloon filled with regular air and no attachments (figured that would about balance out to fully filled with helium balloon of the same size wrapped with tulle, including an 18" tail). The sticks did ok at about 34" with just a 34" stick and the cup (did not have the same result with 2 17" sticks connected with a connector). When I made them taller, more to the centerpiece height I was hoping for, which was about 8ft all connected and reinforced with additional sticks at all the joints, the balloon flopped over all the way to the ground. I added more reinforcement, same result. I came to the conclusion that the only way to combat this was to purchase the thinnest PVC pipe I could find (or another kind of pipe that would look better, but that just wasn't going to be in the budget for this event, neither was the PVC come to find out since I would have needed a stronger base for it too), thread the sticks through that, spray paint the whole thing so it didn't look too tacky, and then attach the balloon. Ultimately, I decided to just experiment with it at the time of decoration. I may just use the tulle to make pretty bows to go around the entire bouquet of balloons instead so all the balloons can help hold the weight. "Hi, I want to make tulle-covered balloons. It says to buy 36" inch balloons but to only blow them up to 19", if this is the case, is it ok to buy 24" balloons?" Where does it say to blow them up to 19" only? If you want the balloons to float, you should inflate them to their full size. If you plan on hanging them from the ceiling, it's fine to use smaller balloons. It really depends on how you want them to look. Hi, I want to make tulle-covered balloons. It says to buy 36" inch balloons but to only blow them up to 19", if this is the case, is it ok to buy 24" balloons? Regarding your question how much tulle you need to cover a balloon, please check out my answer to a similar question here. Just need to know how much tulle I need to cover a balloon? I'm planning to do this for my daughter's "ballerina" themed bat mitzvah centerpieces. I went into a panic when I read that the balloons don't float!! I am going to try using balloon sticks stuck into either floral foam/basket or cylindrical vase with marbles for stability. Has anyone tried either of those? I've received a few questions and comments about this topic. For the balloon to float, its lifting capacity needs to be greater than the weight of the tulle and any other decorative items you would use. Take a look at this helium chart to find the lifting capacities of round latex balloons of different sizes. I would suggest to use a 30 or 36 inch helium quality balloon (e.g. made by Qualatex) and good quality helium. And try to find really lightweight tulle.